This week’s photo is a little different – it was taken underwater! If you follow my travels you already know how much I love scuba diving! 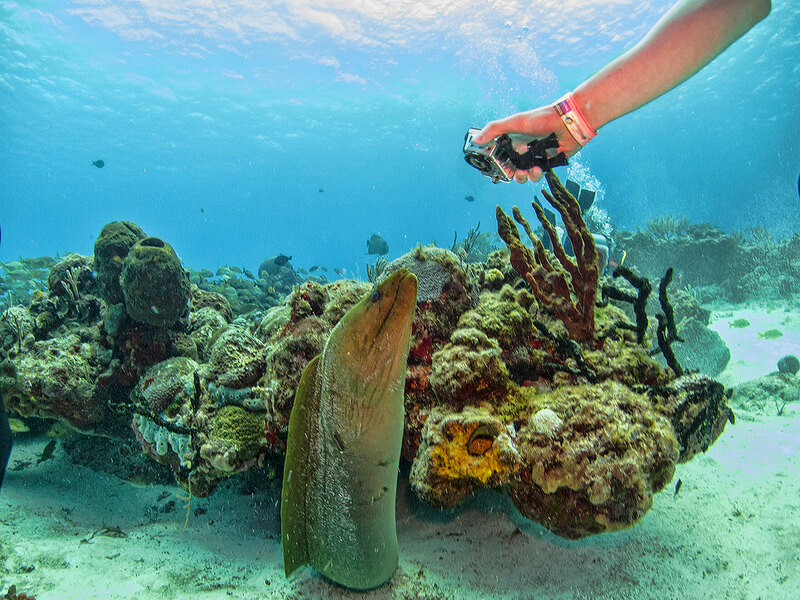 While reef diving in Cozumel, Mexico this large moray eel came out from under his hiding place as our group of divers arrived. One brave young diver positioned himself above while trying to snap a photo and got the eel’s attention. It gave him quite a shot; luckily the eel didn’t get too curious and he left with all his fingers in tact. Awesome, it that your hand there? Nope I’m the one who took the picture, that’s the hand of someone else in the dive group. What a great picture, I would not have been able to stay long enough to take it.